Greek Lemon Garlic Chicken Salad complete with Tzatziki and warm homemade Garlic Flatbreads! 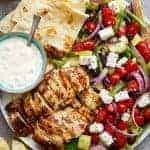 Greek Souvlaki flavours are smothered all over this salad, thanks to an incredible dressing that doubles as a marinade! Whisk together all the marinade / dressing ingredients in large, shallow dish. Pour out 1/3 cup to use as the dressing; reserve in the refrigerator for later. Add the chicken to the marinade and evenly coat; cover and allow to marinade for 30 minutes or overnight in the refrigerator. While chicken is marinading, prepare tzatziki: combine tzatziki ingredients in a bowl and mix well. Cover and refrigerate until ready to serve. Toss salad ingredients together and divide between four plates. Prepare flatbreads using this recipe, or warm store bought flatbreads on a pan over low heat until soft and warmed through. Transfer to warmed plates. Heat a large grill pan / skillet over medium-high heat. Remove the chicken from the marinade and add to the pan. Sear until the chicken is cooked through, about 5-6 minutes each side (total cook time of 10 to 12 minutes). Remove chicken from the pan; allow to rest for 5 minutes. Slice thickly and arrange on salad. Slice each flatbread into four pieces and arrange on salad plates. Drizzle with the reserved dressing and serve with the tzatziki.